TODAY A LOS ANGELES County jury recommended a death sentence for an Atwater Village gang leader. Timothy McGhee was convicted last November of murdering 2 rival gang members and a woman in 1997, 2000 and 2001. He was also found guilty of four attempted murders. He will be sentenced Nov. 21. 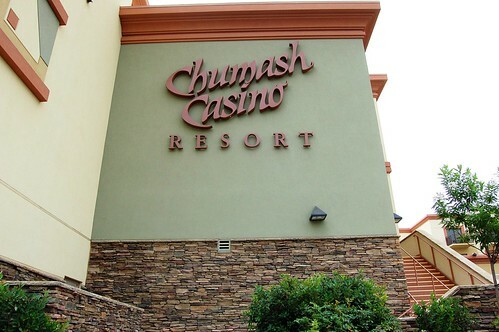 STEP ONE: Go to the Chumash Casino Resort in the Santa Ynez Valley. Step Three: Order a glass containing alcohol. Wine, beer, chocolate martini, anything will do. Step Five: Slowly start to notice how you're the only one in the casino with a drink. Step Six: Get approached by security guard. Step Seven: Tell the truth when security guard asks, "Is there alcohol in that glass?" and sheepishly accompany her to the exit while you learn that Chumash Casino is open to ages 18 and up and forbids alcohol. Step Eight: Stop back later that night, when the casino is packed with people overdosing not on alcohol, but on caffeine from roving coffee carts. Coffee carts! THE SUMMER GAMES aren't the only thing missing from my TV this morning. Time Warner Cable has removed at least 2 channels from my high-definition lineup: CNBC HD and USA HD. UPDATE: Time Warner Cable confirms, on the phone, that CNBC HD and USA HD were only available for the Olympics. 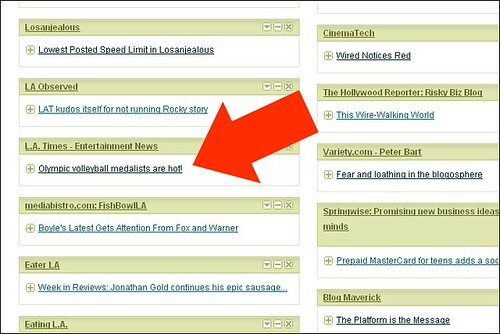 Tough luck, "Psych" fans. 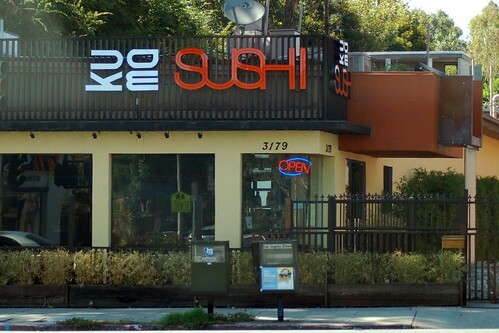 ATWATER VILLAGE'S Kuma Sushi, 3179 Los Feliz Blvd., takes steps toward overcoming Mrs. Newbie's primary obstacle to dining here: "It's good, but a little pricey for a place with so many vinyl banners outside." A gasp filled a downtown Los Angeles courtroom Wednesday as a judge sentenced a former Compton laborer to 11 consecutive life prison terms for triggering a commuter train crash [at the Chevy Chase Drive crossing in Atwater Village] that killed 11 people, deadliest train crash in Metrolink's history. EVERYONE'S FAVORITE reservationless restaurant, Canele in Atwater Village, is on vacation for 2 weeks. P.S. - To the know-it-all at the next table at brunch at Canele yesterday, maybe it's OK to generalize based on anecdotal observations. In a big, diverse place like Los Angeles (without the benefit of actual census data) maybe there's no other way. UPDATE: And the biggest news to hit Glendale since the Americana, Glendale Galleria is getting a Peet's Coffee! Opens September. APPARENTLY THE CITY OF Los Angeles noise rules, where most "excessive, unnecessary, and/or annoying noise" is banned before 7:00am in residential areas, does not apply to the City's own trash and recycling trucks. 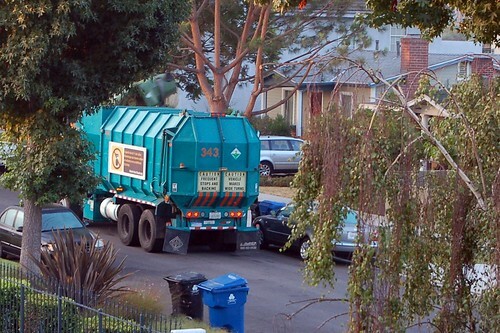 The big trucks can roll a whole hour earlier, starting at 6:00am; hence the 6:40am yard-waste truck invasion this morning in Atwater Village. Does the extra hour really make a difference in collection routes? And if this is a neighborhood's the only regular, excessive and/or annoying noise, does it make sense to exempt it from the noise rules? We meet at Canele, a restaurant Centeno, 34, lists first among his favorites on the east side of town. It's a sliver of a space with exposed brick and ceilings high enough to prevent the onset of claustrophobia. The small dining room dictates a "no reservations" policy, a first-come, first-served axiom that favors the locals of Atwater Village - yet the Mediterranean-inflected cuisine draws foodists from all over the city. A neighborhood joint with excellent food everyone wants to try? We see the appeal. THIS SATURDAY, August 16, 5:00pm to 9:00pm, neighborhood artists open their doors and studios (and with any luck their bottles of beer and wine) to the huddled masses. It's time for Atwater Village's 2008 Artwalk. Amelia Fitzwater: 3129 1/2 Glendale Blvd. Grain: Pamela Burgess & Eban Lehrer: 3135 Glendale Blvd. Black Maria Gallery: 3137 Glendale Blvd. Kaldi Coffee: 3147 Glendale Blvd. Brian Sheffield Photography and Jacob Rushing Photography: 3181 1/2 Glendale Blvd. 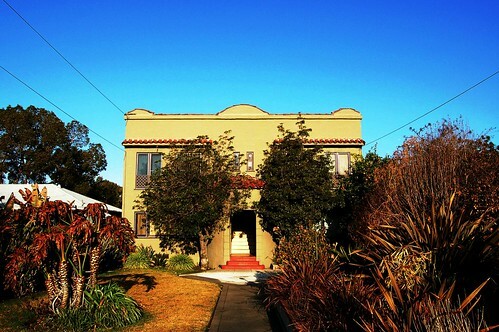 LittleBird Gallery: 3195 Glendale Blvd. Pounder Kone Art Space: 3407 Glendale Blvd. Art and Mayhem Gallery: 3416 Glendale Blvd. Tom Neely: 3152 La Clede Ave.
Andee Eve Husney: 3783 Glenfeliz Blvd. Cathy Ford and Steve Stanard: 3910 Glenfeliz Blvd. Sorry to Tom, his studio at #10 is cut off my map here, but fully represented on the 2008 Atwater Village Artwalk brochure. 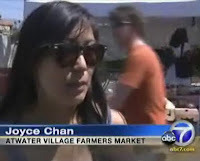 "It's the price of gas I think that has made people think a little bit more about improving their lifestyle and giving back to the earth," said Joyce Chan a shopper at the farmer's market in Atwater Village, [edit: actually, she's the market organizer] where shoppers can buy locally grown produce. The Los Angeles news channel has not, to my knowledge, aired any follow-up report on what secret ingredients might be in the No-Name Hummus we bought at yesterday's farmers market. My report: Tasty! THIS POST IS for anyone who thinks the Newbie overhypes the criminal element in our neighborhood. UPDATE! The day didn't end so quietly, it turns out, after last night's police activity on the end of Perlita near Chevy Chase Park. August 2: "Just saw the Aggravated Assault mark on the LAPD crime map that took place on Tyburn and Garden..."
August 5: "We had gunshots on Garden and Glenhurst tonight around 7:45. In fact they shoot windows out of a car. 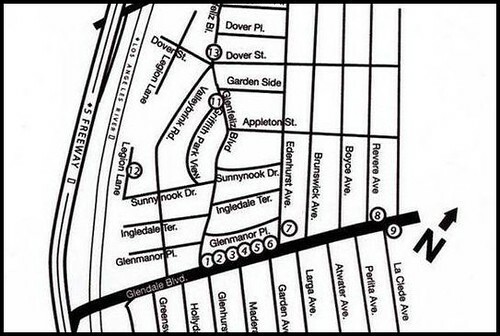 Must be some sort of gang ritual..."
The Atwater Village Crime Spree 2008 Map has been updated. 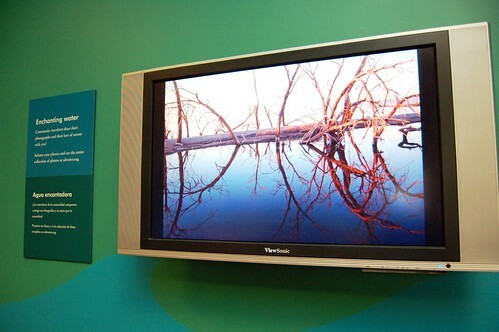 THIS IS WHERE "select" images from the Flickr group The Water: A California Story are displayed, in a randomly ordered slideshow, at the San Diego Museum of Natural History. 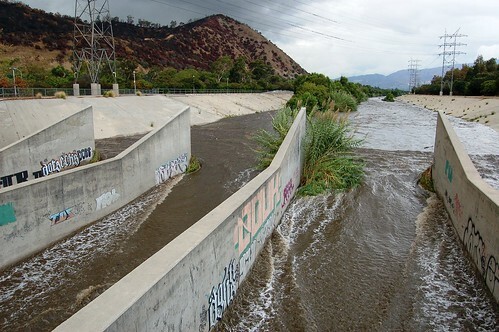 My photograph of the LA River in Atwater Village was "select" but in 40 minutes of sitting and watching on opening weekend, I didn't see it. Maybe someone else will; the Water exhibit is up till November. The community organizer [Stephen Box] says he and about a dozen bloggers drafted a Cyclists Bill of Rights in January that he is presenting for a vote at neighborhood council meetings around the region. But Lenore Solis, a council member in Atwater Village, says she voted against it because the assertion of a right to "full access" on "all mass transit with no limitations" is too broad, and could be interpreted as a legal right to bike lanes on freeways.